As the name suggests, this is a trail race. It takes place on the Titsey estate which is one of the largest surviving historic estates in Surrey and dates back to the sixteenth century. The race is hosted by Oxted Runners and quite a few of their runners volunteered on the day. They have lots of interesting and helpful race information and a course map on the race website. This race is one that I have wanted to run since hearing about it just before the 2011 event. But 2011 had sold out by the time I tried to enter, then in 2012 I missed out again by not registering early. This time around I got a heads up that entries were open from one of my Riddlesdown parkrun buddies (and also an Oxted Runner) and put my entry in straight away. The car park, race HQ, toilets and start line are all in slightly different locations but are all just off the A25 at Limpsfield. In-between the car park and race we walked along the bicycle lane in the road as we couldn't see a footpath - it turns out there was one on the other side of the road, we found it on the way back. Anyway, the ladies took a seat in the race HQ and treated themselves to some cake (50p per slice) while I did my pre-race faffing around. The only pre-race issue was with the toilets - they were supposed to have some portaloos delivered but for some reason they didn't turn up. The back-up toilets were nice enough but had no running water, so the toilets wouldn't flush and the taps were bone dry. I'm just glad that I visited them early. Over at the assembly area, runners were grouped into their approximate finish times and then lead down towards the start line. It was a good idea to do this as the course is fairly narrow and overtaking difficult, especially at the beginning when things are congested. After a loud bang from the starting pistol we were off to follow the densely wooded single lap course through Limpsfield Common and the High Chart. 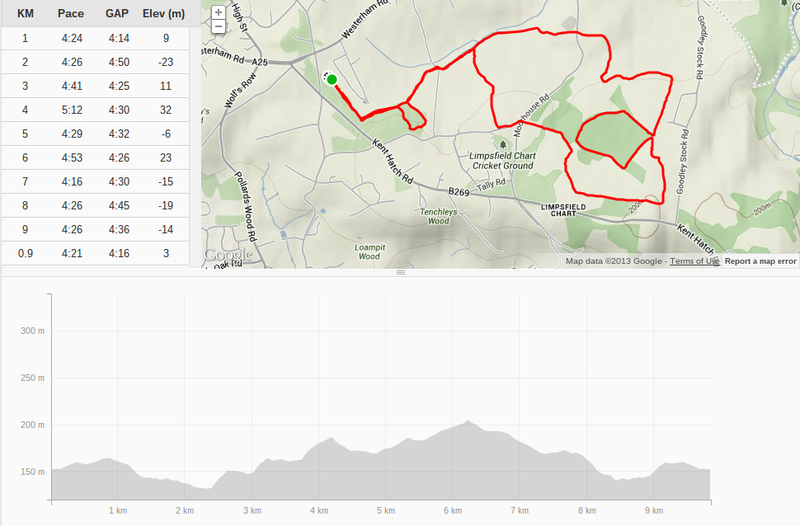 The race is run almost entirely within woodland on a combination of tracks, footpaths and bridleways. Towards the end there is a brief section that is on a road. There are one or two occasions where you leave the woodland and run across fields (complete with plenty of cow pats to dodge!). There are sections of single track paths that twist and turn while taking you higher into the High Chart. You'll also find tree roots trying to grab an ankle and the occasional rock just waiting for you to mis-place your footing. It's tricky to see all of the potential hazards at the beginning while the runners are bunched up but much easier further along once everyone has spread out. At one point you'll have to duck to avoid a tree branch and at another you'll leap over one. Then there's the mud - I have to say that in 2013 we were incredibly lucky as it had been fairly dry in the run up to the race and there was only the occasional spot of mud to wade through, but I hear that 2012's event was significantly tougher due to the mud caused by the wetter weather in the weeks before the race. I haven't mentioned the hill profile yet - well, the first six kilometres are generally uphill (with the fourth being the hilliest according to my GPS data), then the seventh, eighth and ninth kilometres give you a chance to make up for lost time by being mostly downhill. After an initial sharp incline, the last kilometre is fairly flat and brings you back to where it all started. Some of the marshals were people that I know from Riddlesdown parkrun who have become members of Oxted Runners, and I knew roughly where some of them would be, so it was nice to look out for them as I went around the course, and awesome to receive a nice boost when they cheered for me as I passed - Thanks! Given that this was my third 10k race in as many weeks (Chislehurst Chase and Dartford Bridge were the others), I was prepared to ease off the pace and just enjoy running through the beautiful surroundings, and at first that's kind of what I did, but after a few kilometres I got into race mode and started to work a little harder. Saying that, I did take the uphill sections quite slowly, but then I opened up on the latter downhill sections, which was a lot of fun and possibly a tiny bit scary, especially when hurtling uncontrollably towards a sharp left hander at the bottom! As far as splits go, I reached the 5 kilometre point at about 23.30ish, which means that I must have completed the second half in about 21.20ish. At the end of the race, runners were given a medal, water, banana, and a bottle of beer! There is a reason why this event sells out every year, and that reason is that this is such a brilliant race. The woodland course is beautiful, and as it twists and turns and climbs and falls you will never find yourself bored - you are constantly looking out for the next puddle of mud, branch or tree root. So it goes without saying that this is not a race to enter if you are looking for a new personal best, but if you are looking for a nice tough trail race, this certainly ticks all of the boxes.